"In the summer of 1934 the Rainbo Gardens in Chicago re-opened as the French Casino. The venue sited at Lawrence Ave and North Clark Street had been closed in 1932 but had been taken over and completely revamped and redecorated by Jules Stein and Corlett Huff. Jules Stein was an interesting character – reputedly one of the richest men in the USA and president of the Music Corporation of America who controlled the careers of scores of celebrated radio and cinema stars and bands. Stein engaged the legendary booking agent and producer Clifford Fischer to mount an ambitious production for the new venue. 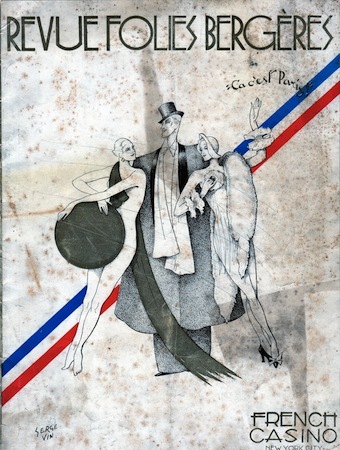 The show called the Revue Folies Bergere was devised in Paris at a cost of $60,000 and featured many performers from Europe... 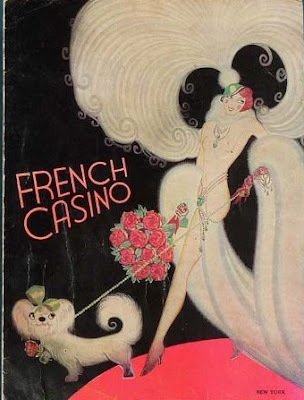 It was as if the Paris music hall had been transplanted to Chicago and the Chicago Tribune reported ‘it is the most ambitious café entertainment now on view in Chicago.’ Needless to say attendance ran at capacity and it became the ‘wow’ of Chicago nightlife." The Rainbo, at 4812 N. Clark, was purchased in 2002 and torn down to make way for a new condo and townhouse development. At one point, however, it was a very popular outdoor music garden, fashioned after the Moulin Rouge Gardens in Paris, which is the original namesake for what was then called "Moulin Rouge Gardens." Investors bought the Moulin Rouge Gardens property and spent one-million dollars to expand the facility. Opened in 1921, Mann's Million Dollar Rainbo Room, named after Fred Mann's wartime service in the U.S. Army's 42nd Infantry or "Rainbow" Division, was said to be the largest nightclub in America, featuring some of the biggest names in Vaudeville and musical entertainment. Larry Fine was performing there the night he was asked to join The Three Stooges. The Rainbo Room had a revolving stage to allow for continuous entertainment. There was table seating for 2,000 patrons and space on the dance floor for an additional 1,500. Until 1927, WMAQ radio shared the 670 kilohertz frequency with station WQJ, which was owned by the Rainbo and Calumet Baking Powder Company; it broadcast music of the Rainbo's performers as a form of promotion. In 1927, during prohibition, it was converted to a major casino and sports venue, called the Rainbo Fronton. In 1934, during the Chicago World's Fair (A Century of Progress), it became French Casino. The French Casino is where John Dillinger spent his birthday, June 22, 1934, a month before he was shot. In 1939, it became Mike Todd's Theater Cafe, which was a popular dinner theater. Tommy Sutton, the Theater Cafe's choreographer, went on to work with Cab Calloway, Duke Ellington and Nat King Cole, among others. It was also a venue for Championship Wrestling where, in 1955, the first women's tag team wrestling match was held. In 1957, The Theater Cafe was converted to an ice skating rink, called Rainbo Arena, which was a practice rink for the Chicago Blackhawks including the year they won the 1961 Stanley Cup. The Rainbo Arena was also a training rink for several Olympic figure skaters, housed a pro bowling alley and the original Kinetic Playground music venue. In the 1960s and thereafter, The Rainbo was a popular late night roller rink until it was torn down for a new housing development called Rainbo Village. "Until 1927, WMAQ radio shared the 670 kilohertz frequency with station WQJ, which was owned by the Rainbo and Calumet Baking Powder Company;"
Even Thomas Pynchon couldn't make this stuff up! I've actually seen some advertisements for Calument Baking Powder which mention the Rainbo. When I got out of the Army in 1959, we lived in an apartment building diagonally across Clark Street from the Gardens.4905 N. Clark. Directly across the street from them was a cemetery. My wife used to take the kids there to play, cuz it was like a park and very safe! The Gardens had become a wrestling arena-- where pro wrestling took place on weekends.